The final 2015 Umpire Clinic being hosted by the USAFL and USAFL Umpires Association will be held on October 16, 2015 in Austin, TX in conjunction with the USAFL National Tournament that weekend. The Umpire Clinic is designed for all comers, from those who are looking to get started and up through those who are working in the accreditation process. In addition to classroom time and field time, attendees will have opportunities to umpire games during the tournament and receive immediate feedback and coaching. Even if you do not desire to umpire now, the instruction you receive from the Umpire Clinic is valuable to players and coaches to help understand the why’s, when’s and how’s of an umpire’s decision making. This year’s clinic is a rare opportunity for new and experienced umpires to really dig deep into their craft as we have more than a dozen veteran umpires coming to visit from Australia, including three umpire coaches. Their purpose at the tournament is to provide the benefit of their expertise and experience to us all by coaching and mentoring all our USAFL-UA umpires. They will all attend the clinic and so should you! 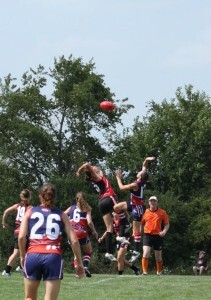 All clinic materials are available electronically on the USAFL website. Please read these ahead of the clinic and come with questions. This makes the clinic much more powerful for all attendees. The Clinic will commence at 1 pm on Friday at the host hotel for two hours of classroom discussion, video work, etc. We will then move to the grounds for two hours of field work 3 pm on Friday and continue discussion where we should be finished by 5 pm. You will be able to work tournament games the same weekend and be provided immediate and continual feedback to help you improve as umpires, and don’t forget; when you work these games you will also be paid. The teams will provide boundary umpires for each game and goal umpires if need be. Please confirm as soon as possible your attendance (or even your desire to attend) with USAFL Umpire Director and Coach, Jeff Persson at umpiring@usafl.com. Jeff may also be reached by cell phone at 615 440-3007. No Replies to "2015 Umpire Clinic Austin, TX"